You must register as a house sitter in order to apply. If you wish to apply, please login or register as a house sitter. 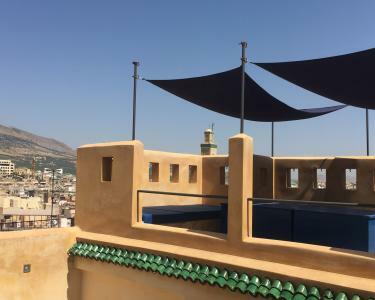 We are looking for someone to take care of our 4 bedroom house in Fes and welcome house swap & other guests. We are looking for someone to start around mid July, taking over from the current huse sitter. Exact dates TBC. Fes is an incredible place like no city in the world and deservedly has UNESCO world heritage stauts. We are keen on having people with some experience of hosting / hospitality. We have just started taking guests so are not busy all the time but there could be busy periods. You will need to get rooms ready, do laundry, meet guests. It's a tall house with plenty of stairs to climb and so you need to be mobile, fairly fit and happy with doing a few hours of work when preparing for guests. There will be plenty of free time in between guests for exploring Fes and beyond. There will be some basic house maintenance jobs to be done - keeping the house clean, tidy and guest ready. Oiling wooden doors, keeping plants happy etc. It's not a passive house sit and we are keen to find a warm friendly host with an eye for detail. I'm keen to have house sitters for 3 months but will consider less. Fes takes sometime to get used to. Knowledge of French or Arabic is useful. Having said that I manage without! Ours is a 300 year old house in the oldest part of Fes medina, within a few minutes walk of the karaouine mosque, Nejarine museum, the henna souk and other culturally important sites. The house has been completely renovated using traditional techniques but with a modern aesthetic. Both main bedrooms have en-suite bathrooms. The master bedroom has double doors which open onto the lower terrace. Stairs lead to the upper terrace with commanding views across the Medina and to the hills beyond. There is a third double bedroom with access to a third bathroom on the ground floor and a small Downstairs and there is a sitting room, library and a modern kitchen and dinning area with a wood burning stove for winter. This is an area of antique shops, artisan wood and leather workers. You will be immersed in the everyday life and sounds of the old city, artisans working, children playing and people transporting goods by mules. Right next to the house is Musee Behl Ghazi with it's orange tree filled courtyard and small private museum. Fes is unlike anywhere else, the old medina is really like stepping back in time several hundred years. A labyrinth of tiny streets where modest wooden doors lead to palaces and the main means of getting bulky items in and out by donkey. Once inside it’s car free. My house is in the middle of the old medina, about 10-15 minutes walk from the nearest parking and taxis. Life in the medina is definitely fascinating, but can be intense and wouldn't suit everyone. There are some lovely places to escape - Riads with secret gardens, hammams, walks in the hills 10 minutes away and an interesting and friendly expat community. For those with an interest in Arabic culture and architecture it is a fascinating place to be immersed in.